Number 7: Rhus typhina 'Tiger Eyes'. I don't usually like Sumacs, but when I do.... it's a Tiger Eyes!! A beautiful cut leaf staghorn sumac. Even the summer colour is a bright charteuse green turning yellow. But, it's really the fall colour that'll get you! 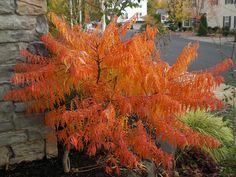 They have an Oriental look, and look fantastic in the garden for some outstanding fall colour. We have them in stock now and they're putting on a show in 2g pots only 24.99.